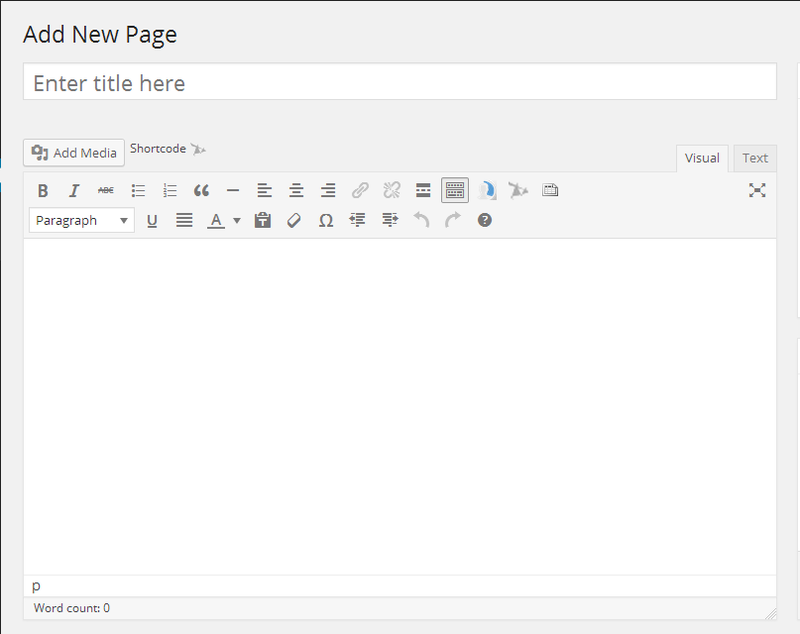 There are several ways in WordPress to create a page. In the screen-shot you can see the main ways to create a page and listed below are the steps used by each option to get you to the main "Add new page" screen. Using option 1 clicking on the button will give you a drop down menu with various options that will change depending on which plugins you have on your site. If you are logged in to your admin and are looking at the site you will still be able to see this option along the top menu. Using option 2 you can hover over the Pages item on the menu on the left, this will cause a fly out menu to appear as shown in the image. If you click on the Pages option the fly out menu will appear below the Pages. Using option 3 on the dashboard will take you directly to the Add New Page window where we are going right now. There are two ways to enter text in this window, the two tabs on the right for Visual and Text allow you to switch from entering the text and images and formatting the page using the formatting menu at the top, this is commonly know as a WYSIWYG (What You See Is What You Get) screen. Alternatively if you know HTML then you can click on the text option and type in your code. For now we are going to be working in the Visual window. Why you are building this blog/site. Why do you believe you have the information that people need? your age bracket - you don't need to give them you D.O.B. but the decade you are in. Are you a family person. Move on to how you got into the subject matter. Have you any qualification related to the subject matter. Do you contribute to any other sites related to the subject tell about it and give a link to it. Now you want to tell them why they need to read the information you are going to be posting. You also want to put links on this page to your social media accounts so people can follow you. 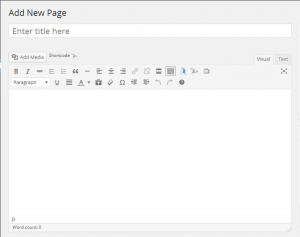 Saving and publishing your new page? At the very far right you have the saving and publishing options along with the options for how you want the page to be displayed, this options display is controlled by the theme you are using. You may only get 1 or 2 variations or you may get many versions to pick from. You will want to use the Save Draft option while you are building the page encase you want to change the name of the page to something else. Also if you don't continue to use the save draft and your system goes down for some reason you will lose all your work. If for some reason you want to publish the page later you can click on the Edit on the "Publish immediately" option and you will be given the option to input a date and time option for the page to be posted, this feature is more often used with posts but can be used for pages as well. If you clicked on the edit button and are not ready to publish the page then just click on cancel and you will be back editing the page. If you have your about page finished then it is time to publish it for the world to see, go ahead and click the Publish button. Hey presto you have a page up on you blog. The page will be published and the system will tell you "Page published. View page" Click on the View Page and there is your new page.